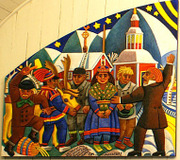 "The left wing of the altar piece in Jukkasjärvi church, made by Bror Hjorth, shows preacher Lars Levi Læstadius talking to the people. One repenting sinner is breaking a barrel of vodka, whild another is giving back a stolen reindeer." "Hjorth was one of Sweden’s best-known sculptors and painters, and was professor of art at the Royal University College of Fine Arts in Stockholm from 1949 to 1959." -- [from Wikimedia] -- Photo by Skogsfrun. Hjorth, Bror. Altarpiece showing repentance, from Art in the Christian Tradition, a project of the Vanderbilt Divinity Library, Nashville, TN. http://diglib.library.vanderbilt.edu/act-imagelink.pl?RC=55964 [retrieved April 24, 2019]. Original source: http://commons.wikimedia.org/wiki/File:Laestadius_Hjorth1.jpg.